How to Configure VMware Fusion for Linux Usage? Hi Dave! I’m learning how to work within the Linux environment and my professor has set us all up with VMware Fusion on our Macs and Ubuntu Linux in the virtual machine. I just want to ensure I have it set up properly for best performance. What do you recommend? Your professor sounds like a bright spark to have you all set up a full Linux install within the flexible VMware Fusion environment. In full screen mode, it’s really just like booting up into Ubuntu Linux, but without the hassle of partitioning your drive or the confusion of how to reclaim that space post-class. Then again, hopefully you’ll be impressed with Linux and keep it as an alternative operating system on your computer so you can keep learning about it! The good news is that for the most part, VMware Fusion makes the right default decisions if you installed the Linux system as a Linux partition. If you just picked generic OS, however, there might be a few things that need tweaking. The best part? 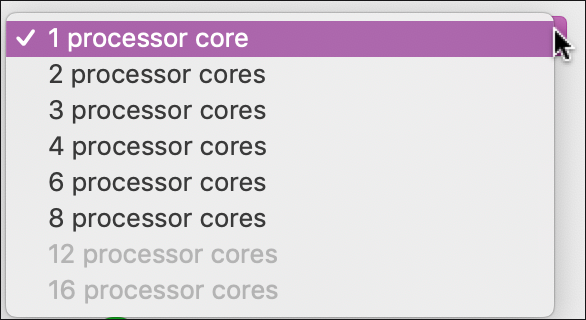 You can decide if you have a multi-core Mac system – and you probably do nowadays – whether to grant access to more than one processor, which can significantly speed up Linux. This is the main settings panel and there are a lot of choices. Don’t be intimidated, however, because most of them you can safely ignore. The key ones I focus on are “General”, which lets you reclaim unused space on your drive, “Processors & Memory”, “Display” and “Isolation” in the bottom row. Let’s look at each in turn. Some operating systems like Microsoft Windows are sloppy with disk space and my VMware Fusion Windows 10 virtual machine often has 2-5GB of reclaimable disk space. No reason not to do so if that’s an option. Linux uses disk space differently, however, so it’s not an issue. Thank goodness. In fact, the only thing to notice here is that you can check “Start automatically when VMware Fusion launches” and you’ll always be just one click away from Linux on your computer screen. Here’s where you can really speed up performance of your Ubuntu Linux virtual machine if you need. Notice I have mine limited to a single processor core and 1MB of available RAM. Since I don’t run processor intensive Linux apps, it works just fine with this minimal configuration. To make it go faster, however, it’s easy to slide the memory allocation to offer more to the operating system. 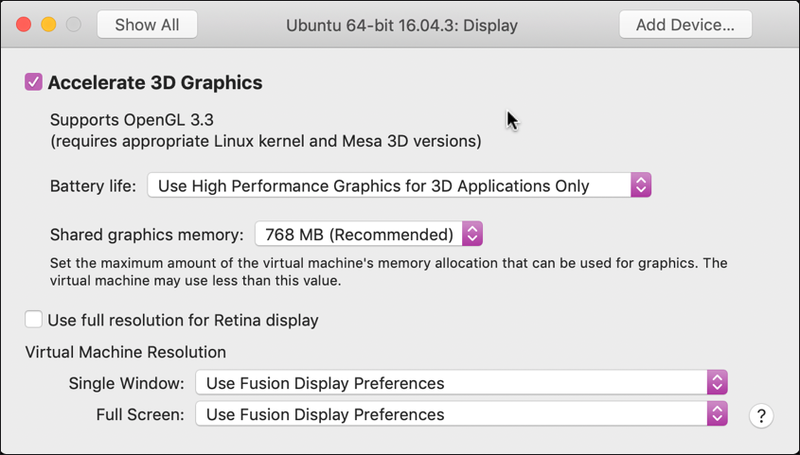 If you want, Ubuntu Linux can definitely handle “Use full resolution for Retina display” if you have a Retina Mac, but be warned, those icons are going to get pretty darn tiny until you tweak Ubuntu to work within that massive a display environment. This is a setting you can experiment with to get the results you want. You can see what I use above. I suggest that you enable both as it makes it super easy to work within your Linux virtual machine and move text, command output, program code, etc, into Mac email, documents, etc. And vice-versa! That’s all the settings I use, so I hope it helps you tune your own VM for best results. Keep up the good work with Linux and don’t forget to check out Linux Journal, where I have a monthly column! Pro Tip: I also have a lot of Linux help here on my site. Please take a few minutes to check it out!